Overall, I felt the episode moved well and had a nice pace to it. The big win was not wrapping up Diaz’s storyline tonight. As much as it would have been nice to have taken him out, his character was built up/developed all season, and he has such a long reach, that it would have felt cheap for him to come to an end within 45 minutes. Ollie’s heart-to-heart conversations were a nice touch, too. Taking time to talk to each team member and leave on a good note is what I feel a lot of people would do when in Ollie’s shoes. Why let grudges continue? He knows he’s done and going away, might as well kiss and make-up, so to speak. I think it also showed growth in his character. He’s willing to just say, “Whatever happened in the past, it’s the past. Forget it and let’s move on.” In a weird way, the deal Ollie struck with Samantha has made him see there’s a much bigger picture out there, even beyond Star City. Seems like Ollie’s martyr act is the last great deed he’ll do for these people for a long time—possibly ever. Of course, the surprise (more like shock), was Quentin’s death. I didn’t see that coming at all. Truthfully, I’m not exactly sure why it happened. I get that he makes the most sense out of everyone. He’s not a costumed hero, but he’s still part of the main crew and his death would bring a shock to the fan base. As much as I didn’t care for the recurring theme of Quentin this season, I ended up liking him as a whole. To me, he was one of the more hard-nosed, black and white characters. There wasn’t a ton of complexity to him and that was a positive. 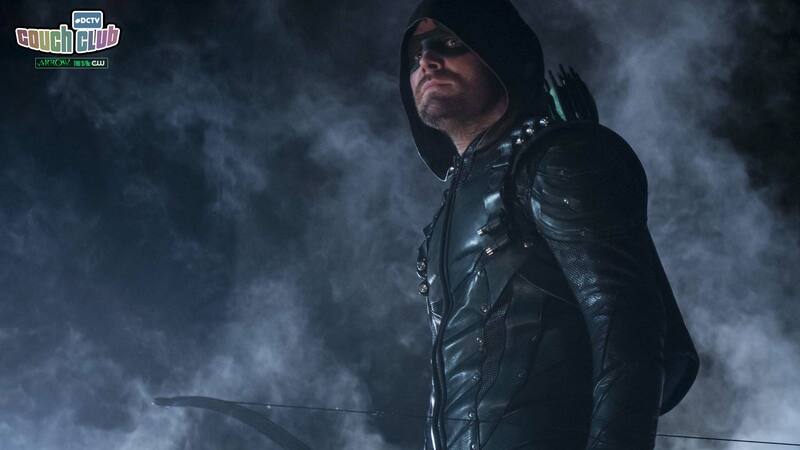 Arrow features a number of characters that have a lot of layers and/or complexities. It was nice to have a more simple, straightforward person in the mix to kind of balance out the rest. If the actor, Paul Blackthorne, is moving on to different projects, I understand the decision. In terms of the show’s continuity, I guess you do it because as the acting Mayor and a close friend of Ollie’s, there would be a conflict of interest with Ollie in prison. One would think that he would do everything he could to get Ollie out—and most likely succeed. So with Ollie’s high-ranking and powerful (government-wise) buddy now gone, it makes things more difficult for the Emerald Archer. Where the episode fell short with me was towards the end. While I was okay with not closing out the Diaz storyline, there was something about Ollie being sent to prison that just didn’t work for me. I think it’s because we’ve seen him in similar positions in the past. All season long he’s been dealing with legal issues and the threat of being arrested, then actually being arrested, getting out, etc., etc., etc. It felt like more of the same. I was hoping this finale would put a definitive end to this angle, but it seems like it’ll continue, and I’m not sure where they go from here exactly. He’s in prison with lot of guys he’s put there, everyone now knows his secret—which puts William in extreme danger, along with everyone connected to him. As funny as it sounds, the only way I could think to move beyond this would have been for Ollie to fake his own death and start a new life. My fear is that next season may be centered on Ollie being in and out of court hearings while serving his sentence. Also, did I miss the “Longbow Hunters” that they referenced a couple times? They built them up to be some ruthless people who could take care of business, but I don’t think we ever saw them. Maybe they’re saving them and Quadrant for a big splash next season? [Editor update: Turns out, that’s precisely the plan.] How will Ollie’s team operate now? I assume the plea deal frees them of their past transgressions, but would not allow them to continue acting as vigilantes, right? I guess we’ll see next season! As always, I had a great time covering Arrow this year. Thanks for letting me share my thoughts with you. Although we don’t always agree, the beauty of these shows and characters is that they open up the floor for some fun conversations. Nice to know they won’t be stopping any time soon!